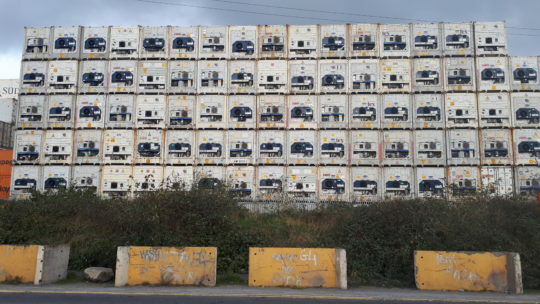 Stacked shipping containers near the Pigeon House towers in Dublin Port, where James Joyce’s characters are heading to in “An Encounter,” but they never reach. I had a very successful experience as a Flaherty Research Scholar working on Irish literature, ecocriticism, and the Anthropocene. The approach that I took to my research during my time in Ireland involved a comparative methodology using the theories and principles of Indigenous literary criticism alongside, and together with. 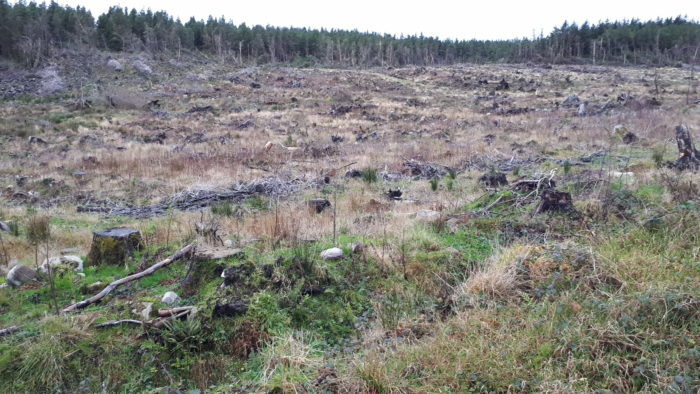 the Irish ecocritical work and practices of Tim Robinson, cartographer, artist, and writer, who closely explores landscape, identity, language, and culture in relation to human story and history by being present on the land itself. These two methodological practices involve the researcher having direct access to the land, people, and stories of the communities under study in an ethical and shared relationship. I began my work by researching the contemporary works of Irish literature, focusing mainly on poetry, that deal with questions related to climate change, environmental crisis, human relationships with the land and non-human others, and the Anthropocene. I began with a reading list and bibliography that I created from time spent at both University College Dublin and Maynooth University and purchased the works in question that were most closely related to the two areas I studied: inner-city Dublin the north-west coast of Ireland. After having read and mapped out a selection of poets from my research, the second part of my project involved exploring the landscapes which the texts themselves represented. This included both urban and rural spaces and involved spending time mapping out and visiting historical and present-day sites around Ireland that bear witness to human involvement in shaping the landscape. 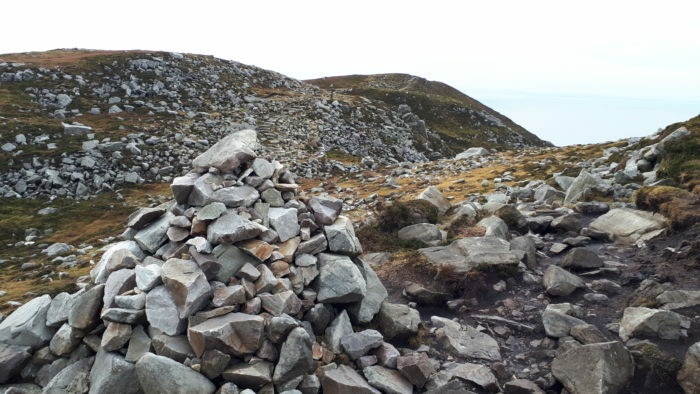 From the industrial waste sites of the port of Dublin, to megalithic tombs in Donegal, my research involved making connections between the literary works and the actual landscapes they portray. A modern-day cairn on the walk along the Slieve League Cliffs, with stone stairs recently built into the hillside. My own attempt to complete the walk along the cliffs was cut short when the trail became impassable due to erosion caused by the overuse of the trail by hillwalkers. Walking across the land, as Tim Robinson does in his work, was an exploratory practice that allowed me to immerse myself in unfamiliar spaces that reflected historical, political, religious, and industrial human practices. Many of the sites I explored during my walks reflected human intrusion into spaces where human activity, erosion, and extreme climactic activity were intertwined. My walks included visits to megalithic grave sites, signal towers, castles, abandoned ports, stone enclosures, peat bogs that were shaped by the removal of the earth, to industrial sites within Dublin, borders, waymarked cliff walks, and religious pilgrimage sites. All of these walks and sites were documented through photography and video. Being present on the land allowed me to construct a catalog of historical human practices that capture the ever-evolving use of tools and land to shape the natural environment and offered me direct access to a long-historical approach to understanding and critiquing where and how humans have slowly affected the landscape through social, cultural, religious, and political practices. Ireland offers direct access to an exemplary variety of pre-historical and modern sites, many of which are recorded in the literary works of Irish authors. As such, my work was enriched by the sheer number of different forms of human construction across a long history, all of which gave a microscopic view of the macroscopic global evolutionary impulses of human behavior that have led to the present-day climate crisis. Benbulben Forest Walk in Drumcliffe, County Sligo. This “forest” walk, which is near to the gravesite of W.B. Yeats, seems to have been recently and almost entirely clearcut. The majority of my research time was spent reading the texts of Irish authors whose work deals with the conceptual elements of ecocriticism or the Anthropocene. A short list of the authors I studied during my stay includes: Paula Meehan, Patrick Moran, Aidan Murphy, Keira McGarry, Jessica Traynor, Mary O’Donnell, Eamonn Lynskey, Francis Harvey, Conor O’Callaghan, Anthony Cronin, Dairena Ní Chinnéide, and Derek Mahon. I was also able to access key theoretical texts on Irish ecocriticism from the Maynooth library and spent a portion of the time in Donegal searching out local works that are more difficult to find. I also attended a number of poetry readings by local authors and visited art galleries and museums that were exhibiting works that deal with climate change and the Anthropocene. In particular, the works of Lisa Gonzalez and Ailbhe Ní Bhriain were showing during the time I was in Ireland, and seeing their works gave me the opportunity to link the landscape, literature, film, and art together, while expanding the way in which I was able to underline my own experience recording the landscape during my visit. During my time in Ireland I met with a number of fellow academics from a number of institutions, despite the fact that the majority of my research time was spent in the field. I met with Gregory Betts, current Craig Dobbin Chair at UCD, as well as one of his UCD PhD students who is working on the topic of ecocritical poetry and the Anthropocene. I was given a tour of the National Folklore Collection at UCD, where I am planning to undertake archival research in the future. I also met with staff from the School of Modern Languages, Cultures, and Literatures at Maynooth, and have a forthcoming talk planned there for March 2019. I also had the chance to meet with John Maher, president of the Association of Canadian Studies in Ireland. I would very much like to thank the Ireland Canada University Foundation for this valuable opportunity to undertake new research in my field of study. I have made plans to use a number of texts that I studied in my forthcoming research and have put together a course on Irish literature to teach on my return to Canada. I am certain that the students attending my home institution will benefit greatly from the time that I had to expand my knowledge of Irish literature and that by sharing my research with them I can inspire them to further study in the field. 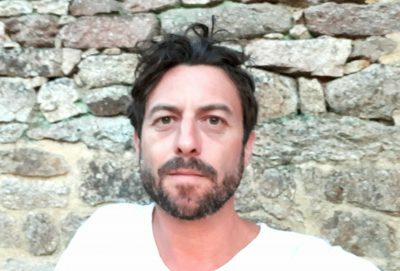 I would not have been able to undertake the distinctly experimental approach to literary ecocriticism and the Anthropocene without the Foundation’s generous support, and I look forward to future outcomes and publications from this project.